We are going to be making a few lists to prepare for your next interview. But before we get into that, you need to know one important thing - why do you want this job? In order to bring your A-game, you have to know the answer to this one essential question that is asked in almost all interviews. Now that you know why you want the job, let's focus on getting to know you! Enter into a brainstorm and jot down as many of your professional experiences as you can think of. Depending upon what you are applying for, these past experiences should be as relevant as possible to the job but don't worry too much about that during the brainstorm. Professional experiences should include customer service situations, professional achievements, stumbling blocks, and aspirations. Depending on your background, whether it's in libraries or not, you should have at least 10 different scenarios on your list. By pairing your situations to possible interview questions,you prepare yourself for the most unlikeliest of questions. You can also choose which responses you like best and kick the other responses to the curb. Now look at all the stumbling blocks and aspirations you jotted down. In order to answer any strength or weakness questions, you must be honest with yourself. If you go into an interview and say that your greatest weakness is being a perfectionist then, guaranteed, the person interviewing you will not be impressed. The correct way to answer any question about a weakness is to be honest and follow up with how you counteract that weakness. Strength questions are, surprisingly, just as difficult. Growing up we are taught to be modest but in an interview we are expected to brag about ourselves. Going through your list, choose a strength that really stands out from the crowd. Interviewers get tired of hearing "detail oriented" as a strength - so don't even consider that as a possibility. Now that you are starting to feel good about your interview, it's time to put some descriptive words into your vocabulary. Quickly jot down 5 to 10 words that best describe your work ethic or professional demeanor. You may want to use a thesaurus for this list, or you can check out Next Day Job Interview from your library and go through the descriptive words list that they have prepared. Using adjectives helps to paint a picture of yourself. Feel free to insert these words throughout the interview and if you are unlucky enough to get a question like "what are your five best qualities and how will they help you perform this job," you won't be stumped! One of the most overlooked portions of the interview is the chance for you to interview the organization. Going into an interview knowing that this is just as much an interview for them can be the key to your success. By asking thoughtful and meaningful questions at the end of your interview not only signals your interest in the position but it gives you time to evaluate the response you are given to make a decision if this is the right job for you. Ideally, you will have prepared 2 thought provoking questions about the position and/or organization but if you have not prepared at all, a good fallback question is "what will I find most rewarding about this position?" Do not, under any circumstances, ask how many open positions are available or benefits questions - while you may get a response, the interviewer will be immediately turned off. With your lists in hand, you should be as prepared as anyone can be. 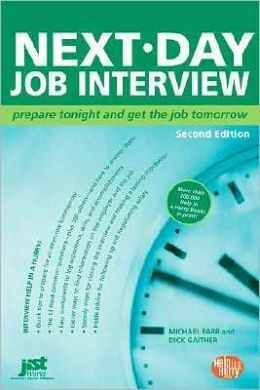 If you are still feeling a little nervous about the upcoming interview, have a friend interview you with surprise interview questions. Most likely, your friend will be less forgiving than any interviewer will be. If your interview is for a promotion within the same organization, I suggest asking questions of those who are already in that position to learn buzz words to use in the interview. Hopefully, with this preparation and a little bit of luck, you will land the job you want!